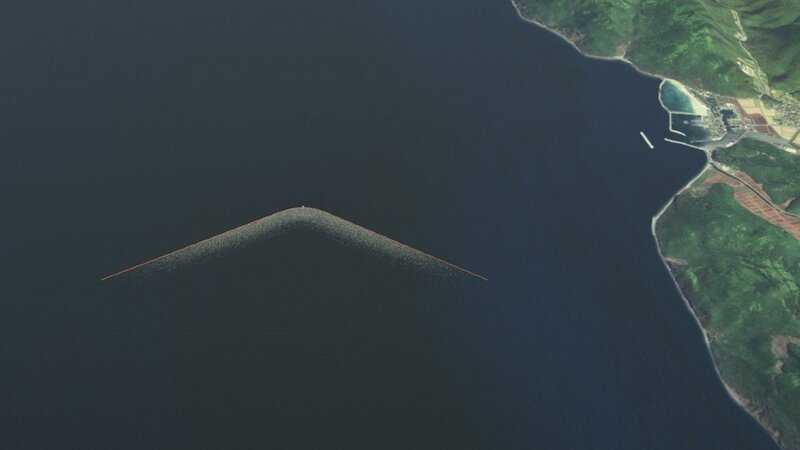 An ambitious new project is hoping to help clean the world’s oceans with a trash collector that is reportedly the longest floating structure in recorded world history. Back in 2013 TrueActivist reported that a 19-year-old developed a plan to clean up the world’s oceans in just 5 years, removing 7,250,000 tons of plastic. However, last week, Boyan Slat (now 21), founder and CEO of The Ocean Cleanup, announced that this awesome project will be deployed in 2016. Slat’s invention consists of an anchored network of floating booms and processing platforms that could be dispatched to garbage patches around the world. Working with the flow of nature, his solution to the problematic shifting of trash is to have the array span the radius of a garbage patch, acting as a giant funnel as the ocean moves through it. The angle of the booms would force plastic in the direction of the platforms, where it would be separated from smaller forms, such as plankton, and be filtered and stored for recycling. The issue of by-catches, killing life forms in the procedure of cleaning trash, can be virtually eliminated by using booms instead of nets and it will result in a larger areas covered. Because of trash’s density compared to larger sea animals, the use of booms will allow creatures to swim under the booms unaffected, reducing wildlife death substantially. The array is projected to be deployed in Q2 2016. The feasibility of deployment, off the coast of Tsushima, an island located in the waters between Japan and South-Korea is currently being researched. The system will span 2000 meters, thereby becoming the longest floating structure ever deployed in the ocean (beating the current record of 1000 m held by the Tokyo Mega-Float). It will be operational for at least two years, catching plastic pollution before it reaches the shores of the proposed deployment location of Tsushima island. Tsushima island is evaluating whether the plastic can be used as an alternative energy source. Pollution in the world’s waterways is one of the most serious challenges that our species is facing, and creative solutions are going to be needed in order to solve this problem. People from all over the world have recognized this issue and have been working hard to come up with their own ideas to clean trash from oceans and other bodies of water. “Taking care of the world’s ocean garbage problem is one of the largest environmental challenges mankind faces today. Not only will this first cleanup array contribute to cleaner waters and coasts but it simultaneously is an essential step towards our goal of cleaning up the Great Pacific Garbage Patch. This deployment will enable us to study the system’s efficiency and durability over time,” Slat said. This article by John Vibes originally appeared on True Activist. The title was changed. There is no affiliation between John Vibes, True Activist and The Grumpy Old Techie. This article as well as the original (Longest Floating Structure In History Sets Out To Clean The Ocean In 2016!) is free and open source. You have permission to republish this article under a Creative Commons license with attribution to the author and TrueActivist.com.